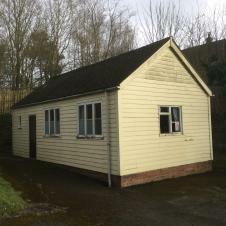 It was in the late 1890s, when much of the population was illiterate, that it was decided that Tiffield should have a "Gentleman's Club and Reading Room" where the men of the village could learn to read and could practice their new skill. The village Reading Room was opened in 1901, and it is now a very rare surviving example of a wooden reading room. It is administered by the Parochial Church Council, and local groups pay a small amount of rent for its use, in order to cover the costs of mains services, administration and insurance. There has been some doubt as to who actually owns the building, and research into this has recently been carried out at the County Records Office, where no title deeds have yet been found! From the church records we know that the building was constructed and given to the village by the Eydon family, and was situated opposite The Old Rectory. It was moved to its current site in 1964, when land was given to the Parish Church by the Eydon family for the purpose. It was at this time that the kitchen and toilet facilities were added by the Parochial Church Council, and in spite of the lack of title deeds, it is generally accepted that the Reading Room does belong to the Church. The Parochial Church Council has recently carried out some refurbishment work to this wonderful old building, including external painting and repairs and fitting a new kitchen. The Reading Room can be booked by contacting the Church Wardens, Mike and Sylvia Dean, at Vernon Lodge, High Street South.